Wheat flour, modified corn starch, salt, monosodium glutamate, autolyzed yeast extract, dehydrated beef stock, hydrolyzed soy protein, caramel color, sugar, onion powder, beef fat, paprika, xanthan gum, maltodextrin (corn, potato), spices, disodium guanylate, disodium inosinate, natural flavor, color added, gum arabic. 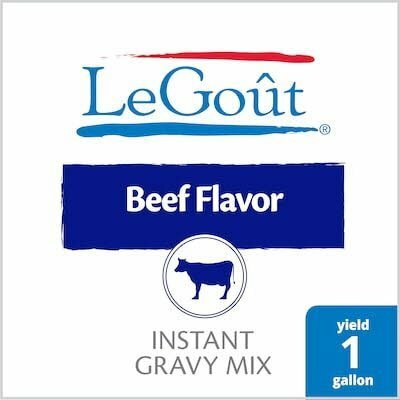 An invaluable asset for any kitchen, LeGout Beef Gravy Mix delivers classic flavor that food service professionals can rely on to perform every day. This dry instant gravy mix makes for a hearty, old-fashioned favorite. Use this meat gravy to accompany your patrons’ favorite meat and side dishes. The gravy powder prepares in minutes; simply empty contents into a saucepan and heat slowly to serving temperature. Classic Gravies deliver superior quality that foodservice professional can rely on to perform every day. These products have convenient, labor-saving formats, a broad selection of classic flavors along with specialty and regional favorites, and easy preparation that takes only minutes.